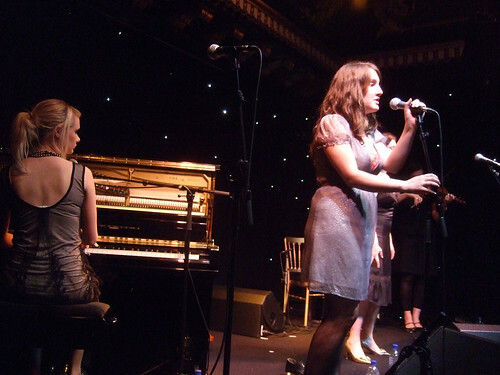 Rachel Unthank and the Winterset, originally uploaded by alister. Rachel Unthank and the Winterset live at Edinburgh Voodoo Rooms 9th May 2008. I was joking before this gig that we were in for an hour and a half of songs about domestic violence in the Nineteenth century. And the first two songs were...about domestic violence in the Nineteenth century. Or possibly the early Twentieth. But what songs. Judging by the small rooms they are still playing there are still plenty of people who have never heard of Rachel Unthank and the Winterset. If you are one of them then check them out immediately. Far from being bleak they are brilliant natural musicians who play with joy and vitality. Check out their myspace for a flavour. Cheers for bringing them to my attention. Much appreciated. Off to see them in Bristol on the 13th, hooray!